So, you want to start a blog? Great idea! Not only is blogging a great pastime, but with a blog, you can uniquely express yourself, help others with problems you’ve overcome, establish yourself as an expert, and even make money. Many successful bloggers gain knowledge, friendships, support, and confidence by hosting a blog. And few of them turned blogging into a lucrative business. How the heck do you get started? There’s a lot of info out there on the web, and everybody says differently. Whom do you listen? Where’s the starting point? Damn, maybe you should just forget it – it’s too confusing for me! Well, hold up. I used to be a newbie in blogging too. I had the same problems. I started my blog (TechCrax.com) way back in 20015, and I knew less than nothing about blogging. It was only the week before I’d learned what a blog was. It used to be required lots of coding skills like HTML, CSS, and PHP, but today is starting a blog can be as simple as creating a document in Word or Notepad. How much will a domain cost for my blog? Where to find well-designed blog themes? Starting a blog is not as difficult as people think. By following the step-by-step instructions in my Beginner’s Guide to Successful Blogging, you will be able to create and grow your blog, avoiding pitfalls and missteps that hinder some novices. Get published. The world is changing, and traditional publishers are falling into irrelevance. Smart authors now make a blog, build a loyal audience and publish their works. This approach works always. Make money. It takes time and commitment, but people make real money from blogs. Here is the Complete Step by Step Guide on How to start with blogging and create your first blog on WordPress Self Platform. Let’s start it from scratch. There are many different reasons people start blogs. Some people blog as a hobby. Some blog to expand their business reach online. Some wish to make more money and see blogging as the platform to do that. Most individual bloggers started a blog because they have a passion for the topic and they have something to say. They also believe they can make money from this topic, either through selling memberships, selling products or through advertising. No matter the purpose of the blog, figuring out the niche market is vital. A blog simply can’t be everything to everyone. Instead, you need to figure out who you are writing to and what topics you’re writing about. 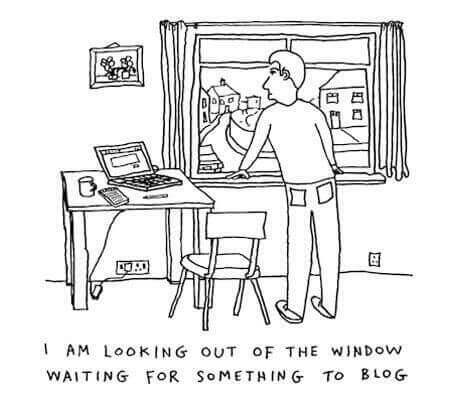 Some people have a clear vision of what they want to blog about. In my experience, though, most people don’t know what to pick! Whatever your reason for investigating how to set up a blog, I can tell you all you need to know. When it comes to choosing a blog topic, just pick something that you’re interested in! You may not be an authority on the topic (yet), but select something that you won’t get bored learning about. Maybe you want to pick something else entirely. It really doesn’t matter, as long as you enjoy the topic, and are interested in learning more. Here are some of the most popular blog categories. With any blog topic, your choice may easily spread into other areas of interest. Don’t feel that the initial topic of the blog will pigeonhole you for life. Feel free to experiment with a few topics, and see what matches best matches your interests and passions. Learning how to start a blog in this day and age is very simple and doesn’t require any technical or web development experience (like it used to years ago). To get started with blogging, you need to choose a platform for your blog. It’s top priority to select the correct platform from the beginning. When it comes to starting your blog you have the following options: free, freemium and self-hosted (recommended) platforms. For many new bloggers, the availability of free blogging platforms such as Blogger or Tumblr is tempting. Of course, there is one big benefit, it’s free. But you need to understand that having a blog name in this form—yourname.blogspot.com or yourname.tumblr.com, is the sign of an inexperienced beginner who likely won’t be taken seriously. By keeping your blog on a free platform, you let the platform own your name. You’ll be subject to their rules and restrictions, they may limit or prohibit ads on your blog, or they may even place their own ads on your blog. If you’re serious about blogging, you’ll want to move away from this option. Freemium means you’ll have a trial period before you have to start paying (costs vary from $5 to $30 per month). Several platforms are available. One of the most popular is TypePad. This platform focuses on ease of use for writing, but customization options are limited and it lacks certain features of value to bloggers. By default, your TypePad blog name will look like this: yourname.typepad.com. It’s not always the best option if you’re trying to build the name and brand for your blog. However, you could point your own domain (purchased through any domain registrar) to a TypePad blog. You have the number of choices when it comes to a self-hosted blog system (also called Content Management System or CMS). The most popular is WordPress.org. This blog option is called self-hosted because you will use your own web hosting space and name for your blog. It normally costs $1 to $8 per month for the web space (hosting account), depending on the company you choose, and $12 to $15 per year for the name (domain). The actual CMS is usually open-source and free. Note:WordPress.Com and WordPress.Org are Two different platforms. Choose WordPress.org if you want a Brand blog. 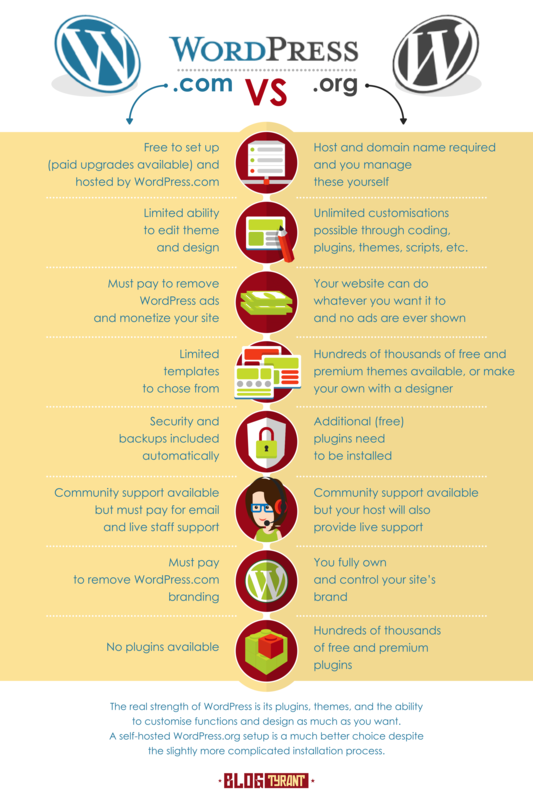 Here is the difference between WordPress.com and WordPress.org(Self-hosted) Platform. WordPress.com – Where they host your blog on the subdomain like foodie.wordpress.com, You can also park Your domain at normal price and can be registered via same. 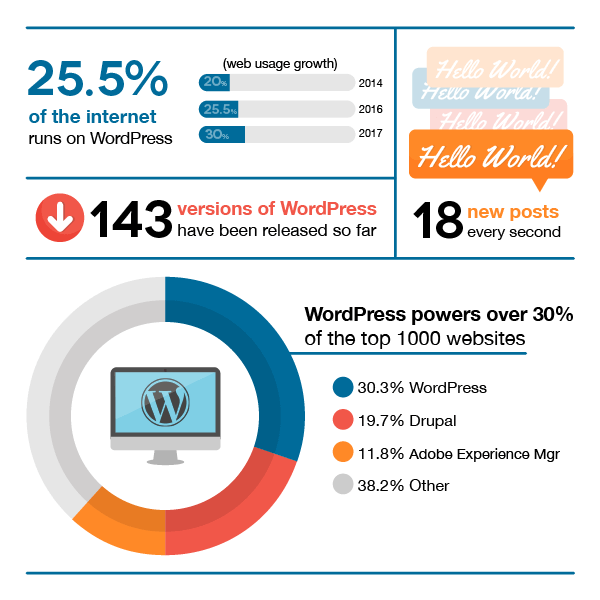 WordPress.org – Self-hosted platform, where you have complete control and host the blog on your own server, Your domain and have full control over how it looks, operates and how you can monetize it. It is entirely free to use, but you need to arrange your hosting, domain, etc. The graph below illustrates the usage of blogging platforms from 2017. As you can see, more than half of all bloggers choose to go with WordPress, something I highly recommend you doing as well. This is the reason most of our sites are on WordPress.org Self-hosted server. Buying a domain name for a blog is a fun thing to do. Some people like to ask friends and family for some direction. Others have a clear view of the domain name they are looking to purchase. You’ll find the perfect domain name for your blog in no time. Should you use your personal name or pick a more general topic? Answering this should be simple. Is the blog about you, or are you trying to build a brand apart from yourself? Make it easy to type. You don’t want other people getting your traffic if someone types in another website by mistake! Make it pronounceable. There’s no need to confuse people with complicated spellings, or creative misspellings. Keep it short. Fewer characters mean less hassle for the user and less risk of mistyping. Don’t use other company’s brand names or trademarked slogans. They will come after you and shut you down! Try to use broad keywords. Top-level topics like Cooking are great, but you need to connect these big ideas to narrower topics. Make sure that the blog’s name makes sense. It needs to be intuitive to the user and Google! Avoid number and hyphens. These confuse people, and it makes it hard to explain the domain to others. A domain costs around $10-$12/year. Many hosting companies add extra charges for additional features. Here is the list of best domain registrars in 2019 to buy your new domain. Web hosting is an Internet service provider that will store your blog content and make it available on the Internet for visitors to access. There are thousands of web hosting providers, most disappear after days of being in business due to the low cost of entry and that is why being smart about your web hosting decision will save you from major headaches down the road. Without a domain and web hosting, your blog won’t be seen online or get any traffic. The two are inseparable! There are plenty of web hosting companies to choose from. Prices generally start from minimum $1 month. Shared Hosting – This type of plan involves placing your website on the same server as other websites. Everyone shares the space and resources, but they are all separate from one another. You’ll have the power and speed to manage your first website just fine. Virtual Private Server (VPS) – The next step up is a virtual private server. This type of plan still places you on the same server as other websites, but there’s a virtual wall separating you from the others. You’ll have access to guaranteed resources and power as if you were on a separate server. Dedicated Hosting – The highest level of hosting simply offers you an entire server to use for your websites. This is usually the option chosen by major bloggers or businesses and comes with a hefty price tag. Cloud Hosting – This has become more popular in recent years. It’s a flexible form of hosting that stores your website across multiple servers. As needs come and go, it can scale with your website dynamically and provide additional resources only when you need them. The following links will walk you through the ordering process at Selected web hosting. Now that you’ve got your web hosting account, let’s work on actually setting up your new blog. One, you can do it manually by downloading the files from WordPress.org and uploading them to your web host; or, use the auto-installation app provided by above hosts. Both methods are fairly simple but for newbies – I don’t see why you should do this manually. The easiest way to setup WordPress in your Any web hosting account is to “auto” install it using the built-in App Installer or from other auto installers from Softaculous and Installatron. With the support of auto installation service, the process is pretty much idiot-proof and can be done in just a few mouse clicks. You can refer to the following links for additional details. Install WordPress Manually from cPanel. The things might look different if you are doing this (auto-installation) on other web host but the process is generally the same. As long as you are sticking with an auto-installation app like Installatron or Softaculous or Simple Scripts, the process shouldn’t take more than 5 minutes. Tip: It’s a good idea to bookmark this wp-admin login URL since you will be coming in here very often. More tip: It would be even better if you change this login URL to something else (ie. exampleblog.com/login-page) for security purposes. 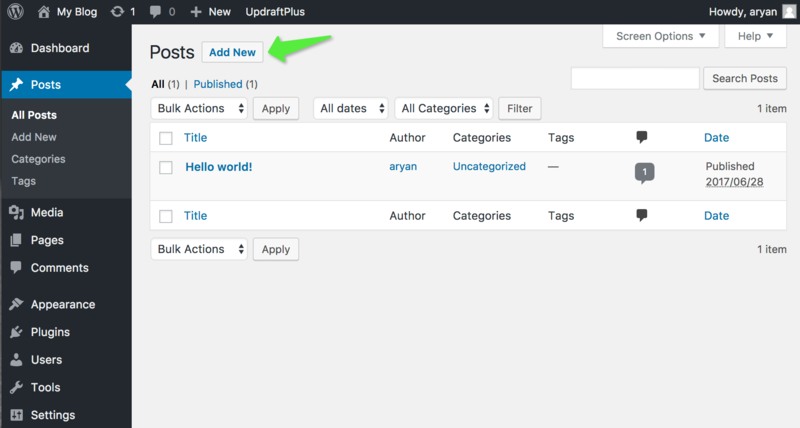 Here’s a quick view on how WordPress dashboard looks like. Pretty cool, isn’t it? And we are ready to publish our very first post. To write and publish a new post, simply navigate to the left sidebar, click ‘Posts’ > ‘Add New’ and you’ll be directed to the writing screen. Click ‘Preview’ to preview how things look like on the front-end (what your readers will see), click ‘Publish’ once the post is complete. Hola! You now have your first blog post published. Now that we are done with the basics in blogging, it’s time to take a deeper dive. The beauty of WordPress is that your blog’s design, also known as the theme, is separated from the backend system. You can change your theme as often as you’d like, customize a packaged theme, or even create a new theme from scratch if you have the design skills. Truth is, most individual WordPress bloggers do not create their own blog themes. Rather, what most of us do is to pick a ready-made theme (or a raw theme) and customize it according to our needs. There are endless numbers of beautiful (and useful) WordPress themes around the Internet – a simple search on Google will lead you to millions. If this is your first time establishing a WordPress blog, my suggestion to you is to start with a ready-made theme and tweak it along the way. This is where you can get all the free WordPress themes. 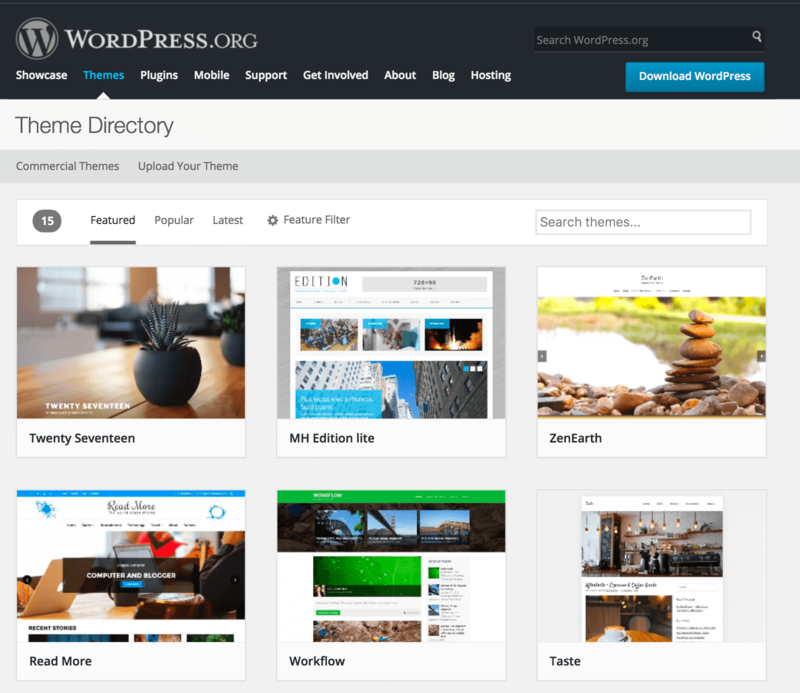 Themes listed in this directory follow very tight standards provided by the WordPress developers, hence, in my opinion, this is the best place to get free, bug-less theme designs. Another way to get high quality paid themes is to subscribe to blog theme clubs. Theme clubs offer a wide variety of designs for one low price. The overall look and feel of your WordPress blog is controlled by your theme. Choose a theme that you are comfortable with, one that gives you the look and feel that you want for your blog. There are two basic parts to the theme used for Blog Basics: the framework (structure) and child theme (look & feel). Framework – There are several WordPress frameworks to choose from, however, we use the Genesis Framework on nearly every blog we build. The reason we use Genesis is because it’s fast, optimized for search engines, and StudioPress provides fantastic support. Child Theme – Now that you have the Genesis Framework, the time has come to choose your blog design or child theme. There are loads of different options. Practice patience looking through them and make sure you pick the design that suits your blogging purpose best! This all sounds nice, but how does it equivalate to your brand new blog? Right now you’re looking at a blank canvas and you’re eager to get painting. I understand completely, so we’re going to boil it down. Does it have all of the features you need? On a separate page, create a list of the things you want the theme to do so you know what you’re looking for. Does the theme have support for third-party plugins? You shouldn’t run into any themes that aren’t compatible with plugins, but you should look to see if they compliment the ones you’re going to use. Say you want to install Woo Commerce. You may want to choose a theme that is specially designed to work well with that plugin. Free or Premium? 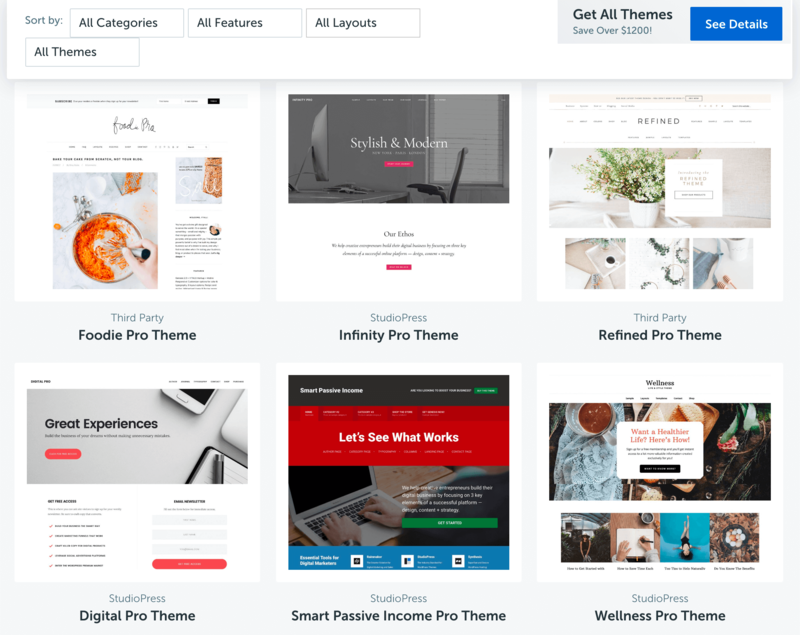 WordPress offers both free and paid theme options. You can start with a free one and switch without much hassle, but you should know that themes aren’t very expensive if you want to go premium. It’s important to check that the theme is updated regardless of it being free or premium. Pricing Model? Premium themes come in a few different flavors. Some of them have a single payment that includes support and updates, while others will have recurring payments. In some cases, you can pay for access to a membership that gives you multiple themes to choose from. Customization Options? Themes are usually designed with some level of customization in mind. You should consider how much control you want. For some, a few big options are best because they don’t have design experience, while others prefer to tweak everything they can. How’s the SEO and Speed? The user experience people receive when interacting with the theme is very important. You should look for a theme that boasts clean coding and high SEO standards. It should load fast and look great for the best results. StudioPress and My Themes Shop are two examples, but there are many others out there. Some clubs even cater to a particular industry, such as business or education. I am a premium subscriber to MyThemeshop from many years. I have used Genesis Framework themes from StudioPress. 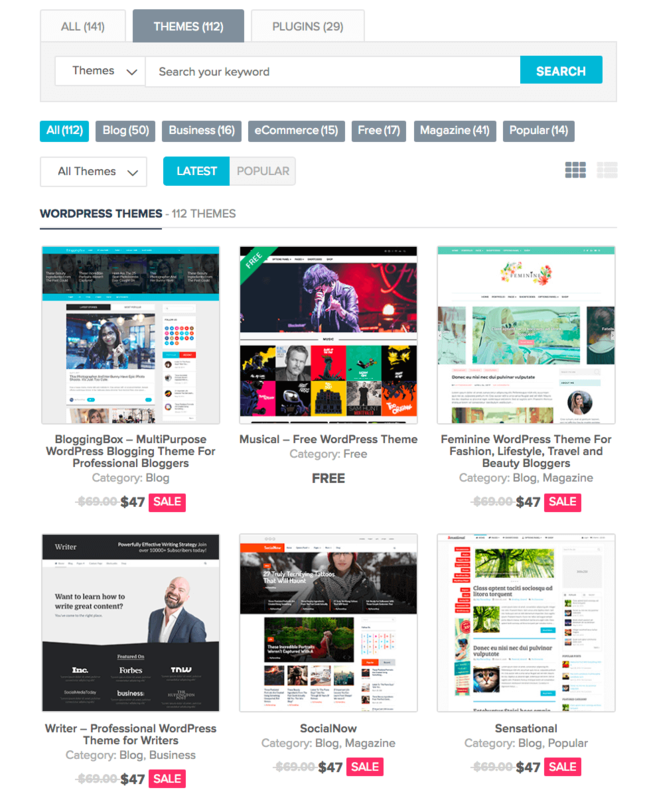 For your reference, here are some of the WordPress themes available on Mythemeshop. You can go check out all their theme and Plugin designs. Free is (always) good. But do keep in mind that you might not get the kind of professional designs and comprehensive functions you wish with those free themes. Generally speaking, paid themes are better supported and frequently updated. Plus, there will be far fewer bloggers using a paid theme at any given time (if branding is important). Now you have everything you need to get started; hosting, domain name, WordPress, and theme, now you get to have some fun tweaking your blog to give it the personalization you want to deliver an awesome experience to your readers! For example, you can customize your navigation menu, logo, footer, sidebar and much more be depending on the theme that you selected. We also recommend that you start capturing email addresses and begin communicating with your audience by email. Delete the “Hello world” post by going to posts > All posts > Place your mouse on the post > Trash. Do the same with your sample page by going to Pages > All pages > Hover over it > Trash. Install the theme of your choice by going to Appearances > Themes > Install Themes > Add New. When you find one, be sure to install it and click activate. Go to Plugins > Add New to start searching for plugins to download and activate like the theme. Go to Settings > Discussion to enable or disable comments as you see fit. Click save changes when you’re finished. Set up your permalinks by clicking on Settings > Permalinks > choose permalink structure/create your own. I personally create my own. One of the big reasons why WordPress is so widely accepted is the ease of use of plugins. Plugins are additional functions that you can add to your blog, such as site backup or social media share buttons. Plugins not only make your life easier, they can enhance your blog and protect your work. Contrary to popular belief, a well-designed plugin does not slow down your blog. There are some plugins that you must at least know about and have. It’s important to keep certain things in mind as you install plugins. For starters, you should look for ones that have a good amount of reviews and a reputable developer. As you update your WordPress installation, you’ll find that certain plugins won’t be compatible with newer versions, so consider this when downloading them. If you like this free step-by-step blogging guide, feel free to share it with the buttons below. It just might help someone else who is looking to start a successful blog. If you’ve, any additional tips don’t forget to mention it out in the comment section and don’t forget to share these articles with your online friends and followers.